As sanctions bite against Iran, its national shipping line is believed to be putting unsafe ships to sea to try to beat them. Are Asian nations prepared for the costs of a disaster? International sanctions against Iran’s national shipping line in response to Tehran's nuclear ambitions are intensifying. The world’s largest container carrier, Maersk, has suspended operations at three Iranian ports, while the US Treasury Department has launched legal action against 121 companies and individuals affiliated with the Islamic Republic of Iran Shipping (IRISL). 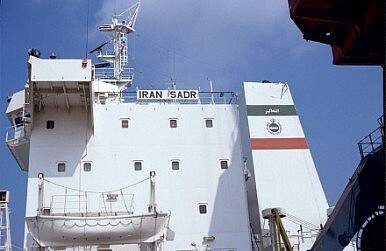 The latest round of measures, aimed at Iran’s ballistic missile and nuclear programmes, came after IRISL was ostracized by the international maritime community with mortgage foreclosures on its ships and saw access to insurance greatly limited, prompting speculation IRISL is facing its own death knell. However, as IRISL limps on, a new and potentially deadly risk has emerged – particularly in East Asia, where the monitoring of IRISL’s fleet has improved dramatically, but surveillance still remains patchy. Doing business with Iran and IRISL has become increasingly difficult in recent years with United Nations, European and US sanctions making even the most awkward operator cautious about trading with the country. Tehran insists the sanctions are unjust and that its nuclear programme is purely for peaceful purposes; IRISL has echoed those sentiments and says its operations remain profitable and sound. While maintaining this stance, IRISL has also been accused of attempting to evade sanctions through a complex network of front companies to take advantage of loopholes in maritime security. But maritime law now poses a problem for IRISL and the waters that its ships ply. Under the International Convention on Civil Liability for Bunker Oil Pollution Damage (2001), ship owners are required to hold insurance or other financial security to cover the liability for pollution damage in an amount equal to the limits of liability. This limit is usually up to $1 billion. A well-documented cat and mouse game has therefore been played out as IRISL tries to buy adequate insurance for its operations. Of one specific class of insurance – protection and Indemnity, or P&I – the potential consequences could be felt well beyond the United States, Europe and Iran. When goods are shipped around the world, the owners of the goods and vessels usually take out marine insurance. This cover, however, doesn’t generally extend to third party liability in the event of an accident. ‘P&I cover is third party liability insurance, which provides compensation to third party victims of maritime incidents,’ says Andrew Bardot, Secretary-General of the International Group of P&I Insurers. Iran’s leaders see little domestic political benefit to giving into the demands of the U.S. and its partners over Tehran’s nuclear program. The calculation shows no signs of changing.